Pi'illo Blimport is a large blimport that appears in Mario & Luigi: Dream Team. 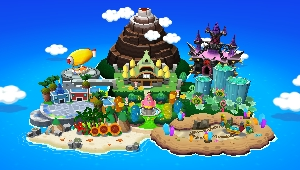 It is home to all of Pi'illo Island's blimps, most notably the one Mario and co. arrive in Pi'illo Island on, the Zeeppelin. As indicated in the official guidebook, the other blimps are called Conkstream, Snorigible, and Naptune IV. Mario, Luigi, Toadsworth, Princess Peach, and several Toads start their vacation on Pi'illo Island after landing here in a blimp. The group (barring Luigi) head to Pi'illo Castle while three Toads try to wake up Luigi who was having a nightmare. 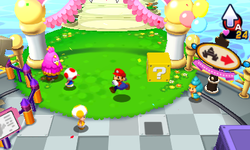 Mario and co. are welcomed to the island through the form of events such as a quiz and an act put on by Broque Monsieur. Upon the appearance of Neo Bowser Castle in the skies above the island that many of the people on the island rushed to the blimport as soon as the castle destroyed the surrounding smaller islands, and it was forced to be closed due to the mass amounts of traffic. Later on during Mario and Luigi's hunt for the Zee Parts, they return here after learning the whereabouts of the Fly Guy R Thieves who stole their newly-obtained Driftwood Jellyfish Sheets on Driftwood Shore. After playing a deceitful trick on the thieves with the help of Prince Dreambert and Starlow, Mario and Luigi regain the sheets and defeat the thieves. Koussinos is French for Pi'illo. Begaero Gonghang Begae(-)ro, literally means 'to the pillow', and Gonghang means an airport. This page was last edited on February 8, 2018, at 19:24.